If you need a system for highly professional visitor management, you will be delighted by EasyLobby SVM ™ (Secure Visitor Management). Visiting and documenting visitors – the friendlyway systems are designed in such a way that even in this area no wishes remain open. Take a closer look at this category and get a first impression of this outstanding product. We offer interactive solutions of the extra class – at an attractive price, of course. This high-quality visitor management includes comprehensive visitor registration, tracking, reporting, and printing the enterprise-class name tags, as well as web-based pre-registration by employees, integration, including access control, usage management, and, of course, employee timekeeping. You will hardly find a better system for professional visitor management on the market. Convince yourself and contact us if you have any questions. We are also broadly positioned in this segment and can provide you with systems that can be easily customized. Choose the friendlyway hotline 089 – 95 97 91 33 if you have special requirements or questions. If you are looking for tailor-made system solutions, you are always in the right place at friendlyway. With our system solutions, we are always one step ahead of the competition! Whether you have security or reception staff who welcome and manage visitors, or unattended areas where visitors can sign up for themselves – EasyLobby has everything you need. The EasyLobby has already been installed in thousands of companies, regional and local authorities, hospitals, universities, schools, residential buildings with several rental units and numerous office buildings. If you need it, we recommend you to contact us directly. Do not hesitate to contact us if you want to take advantage of this excellent management software. We are already sure that we will be able to help you. Do not waste any time and secure a system for optimal visitor management. 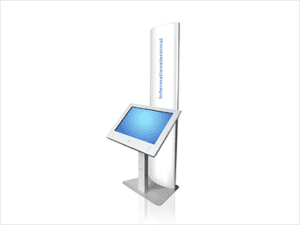 If you need additional Presentation Systems or terminals of a special kind, you have found a very experienced partner in friendlyway. We look forward to your inquiry!